Dynamis Razorback Blade: Efficient, Minimalist Double-Edged Combat/Tactical Fixed-Blade Knife for Edged Weapons Combatives and Self-Defense! | DefenseReview.com (DR): An online tactical technology and military defense technology magazine with particular focus on the latest and greatest tactical firearms news (tactical gun news), tactical gear news and tactical shooting news. 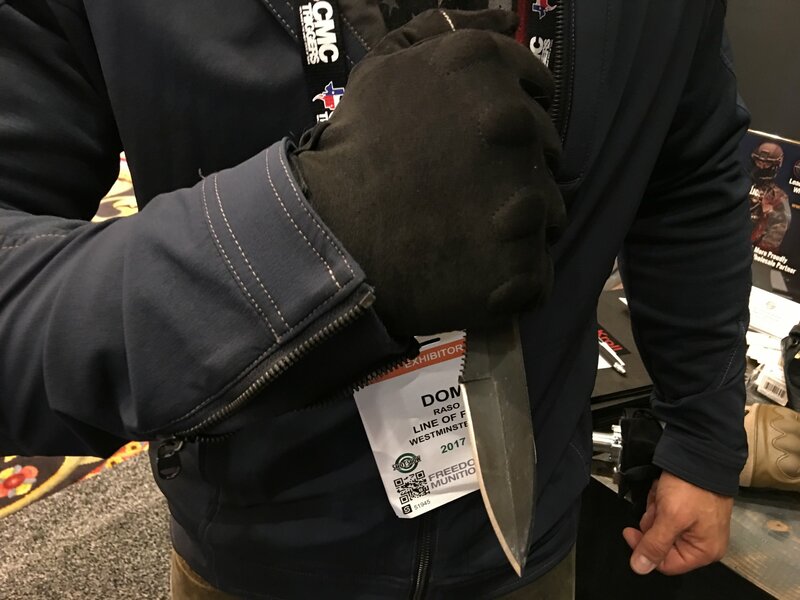 As long as we’re discussing interesting new Dynamis Alliance combat/tactical gear at the Line of Fire Tactical Gloves (LOF Tactical booth, we should perhaps also mention the Dynamis Razorback Blade double-edged combat/tactical fixed blade knife, which we also saw at the Line of Fire Tactical Gloves (LOF Tactical) booth at SHOT Show 2017. 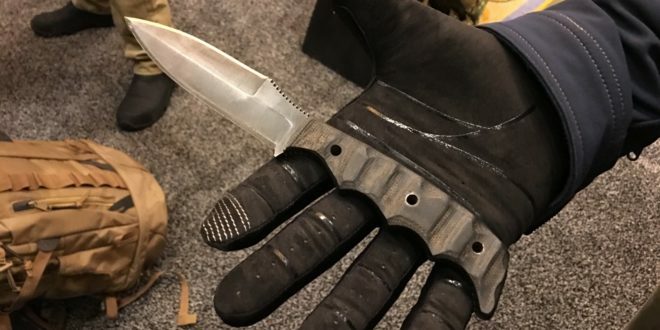 The Dynamis Razorback Blade is a good-looking knife that appears to be well-designed for its close-quarters-combat purpose, and displays Dynamis’ seeming efficient, minimalist approach to combat tools and gear. The Dynamis Razorback Blade DefenseReview (DR) photographed at SHOT was non-serrated, but large serrations on the back edge would appear to be available as an option, and this would be DR’s personal choice. DR prefers combo serrations on a single-edged blade or a serrated back edge on a double-edged blade for their utility in cutting through seatbelts and clothing fabric, provided they’re designed in a way that doesn’t hamper the blade’s combat effectiveness/utility. The Razorback Blade’s scales (G10? Linen Micarta? Canvas Micarta?) are also well-designed and comfortable in the hand, with deep, functional and attractive finger grooves. DR also liked the show blade’s matte grey battle-worn finish, and the scales’ brownish’ gray color. Suggested MSRP for the Dynamis Razorback Blade is $449 for just the blade, but DR would opt for the Blade/IWB Sheath/Trainer combo for $549. Defense Review has requested some additional information the Razorback Blade, and we’ll update this article accordingly when we receive it. We specifically requested information on the Razorback’s development history, but we’d also like to obtain some materials, size and weight specs, as well. 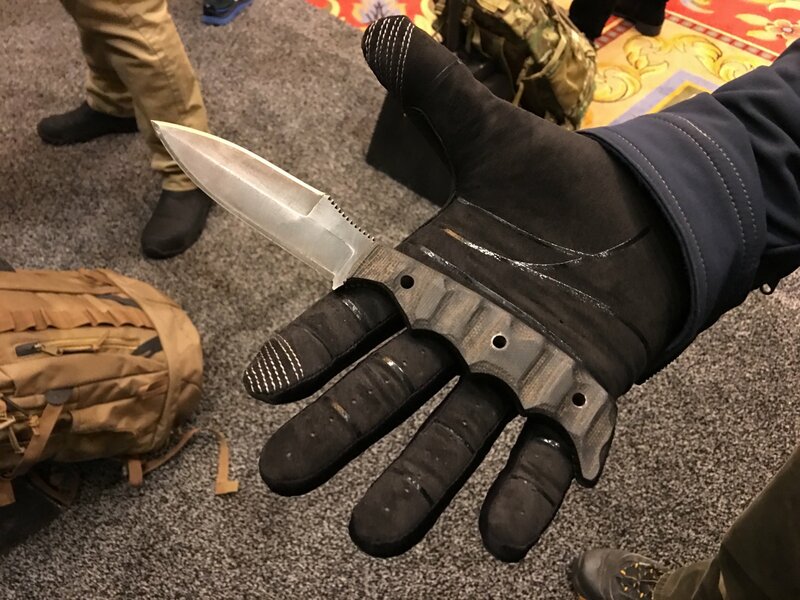 Hissatsu Combat/Tactical Tanto Knife: A Japanese-Style Solution for Modern Spec-Ops/Tactical CQB Problems. Next: Cherries Covert Ops Apparel Pocket-Carry High-Viz I.D. Cap for Concealed Carry (CCW): Collapsible/Folding Baseball-Type Hat for Your Pocket, so You can Immediately Identify Yourself and not get Shot!